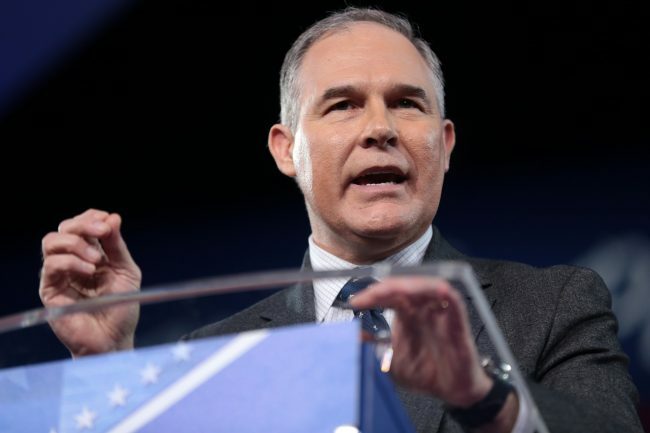 President Donald Trump tweeted he accepted Scott Pruitt’s resignation as head of the Environmental Protection Agency (EPA) on July 5, 2018. In the tweet, Trump announced that the EPA Deputy Director, Andrew Wheeler, will be the acting director beginning on Monday, July 9. The rest of the message consisted of high praises for “Andy” and the EPA as a department. Pruitt has been under attack, by both Republicans and Democrats, for the way he manages the department, his questionable ethics, and his spending. He faces at least 12 federal investigations as a result of his misconduct. His actions started to draw attention earlier this year. Pruitt’s most egregious act was using tax-payer money to fly first class to U.S. and international destinations, which reportedly cost $105,000 during his first year in office. Moreover, Pruitt’s relationships with lobbyists is another disturbing betrayal. He paid $50 each night he stayed in the D.C. condo of Vicki Hart whose husband is the chairman of Williams & Jensen, a lobbying firm. The former EPA Director also spent time with other lobbyists in countries like Spain and Australia. He added a sound-proof booth in his office costing $43,000. This expenditure was determined to be illegal by the Government Accountability Office since he failed to obtain approval for remodeling costing over $5,000. Pruitt’s expenditures were excessive and cost the taxpayers millions. He used his staff and security to perform duties for his wife and run personal errands. The department spent $3.5 million on 24/7 security, bulletproof vests, and a new SUV.